Rahu the Shadow Planet is a legendary master deceptor, thrives in foreign exotic lands, deals with off-shore companies, drugs, poisons, and all manner of pleasure seeking. Charismatic and dark. 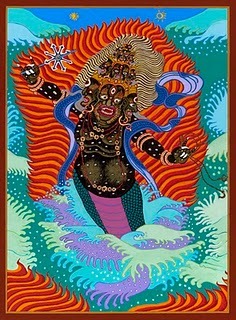 Lately I’ve been reflecting on Rahu’s scope of influence. In light of the current Rahu-Saturn conjunction in Libra getting closer throughout August and September, and peaking at Sept. 25. Rahu is very involved with viruses–and the dispersion of micro-organisms–as much as ideas. Individuals who have significant Rahu aspects in their astrological charts, or who are running Rahu cycle, can easily excel in the areas of the internet, media, TV and film, marketing, sales, promotion, and other means that instantaneously “populate ideas” in cyber space. Rahu is legend in being master of deception. He thrives in foreign exotic lands, off-shore company businesses, drugs, addictions, poisons, and indulges in all manner of pleasure seeking. Have you noticed how the recent two years have been rife with news about countries accusing their neighbors of hacking into their computer systems, whereas almost every country that can afford to is doing it to their neighbor? Cyber identity fraud and cyber espionage are rampant. Also, Wiki leaks and Snowden’s exposure of NSA antics. That’s all been in the news and it’s so Rahu. Rahu is also involved with real viruses, such as those that cause influenza, plagues, and epidemics. Right now a Chinese woman, a poultry worker in Guangdong Province, is hospitalized and suspected of H7N9 infection. The case, if confirmed, would be Guangdong province’s first human H7N9 infection, that is, human-to-human transmission. This may unleash another round of virus scare in the region. I am reminded of records from The Old Testament. The Bible is filled with tales of prophetic dreams, archetypal symbolism, synched up with non-ordinary events in real life. For example, the story of Moses as told in the Book of Exodus. Moses probably grew up as a nephew or grandson to the Pharaoh. When he was younger, Moses murdered a man, which caused him to flee to Midian. Pharaoh had tried to kill Moses, but in vain. After this Pharaoh died, the succeeding Pharaoh continued to oppress the Hebrews. Moses returned to Egypt. Suggested historical dates are c.1440 BCE under Pharaoh Thutmoses III, and c.1250BCE under Ramesses II. But get this, Moses appeared before Pharaoh with a sign of a staff turning into a SNAKE. This gives me an idea that Moses was some kind of Magi, or Sorcerer, and he certainly wielded snake power. -Nile turned to blood and fish in the Nile died. -Plague of frogs 7 days following the plague of blood. -Swarms of flies; region of Goshen excluded. -Pestilence on the animals; livestock of Hebrews excluded. -Boils on people and animals. -Thunder, severe hail, and fire against fields, people and animals. Barley had formed ears, and the flax was in bud. Before the spelt and wheat. Goshen excluded. -Death of firstborn people and animals. Hebrews excluded. The freakish phenomena of algae and marine life gone wild, widespread plague of fish, frogs and blood; massive attacks by insects—gnats, flies; pestilence breaking out in livestock, infected with boils and then cross-species jumping to infect humans. Meanwhile, extreme weather patterns of thunderstorms, hail, fires, topsy-turvy crop yields, locust plague, leading to more pestilence and death. Does that sound a bit like Rahu or what, and is it not quite similar to our current time? Lord Rahu seated with his two consorts.The statues clothing turn to blue, after the elaborate Abhishekam (milk ablution); Thirunageshwaram-Rahu Temple in Kumbakonam, Tamilnadu, Southern India. Last but not least. Radiation effects from the Fukushima Daiichi nuclear disaster of 2011. That also bears the stamp of Rahu. Tokyo Electric Power admits contaminated water has long been leaking into the Pacific Ocean, defying containment efforts. Japan’s government views the situation as “urgent.” Well we are only seeing the tip of the iceberg in terms of adverse effects. Sadly to say, there will be more “entangled” issues to work out even for future generations. What are effective remedies for these Rahu-related phenomena? The simple awareness that such correlations might exist– between the celestial bodies and the harvesting of personal and collective karma in the human plane–will already shift globa consciousness. There are of course, mantras, pujas, homas (fires) and simple rituals to participate in, to get on the good side of Rahu-Ketu and other cruel planets, so you can ask for their protection and graces.